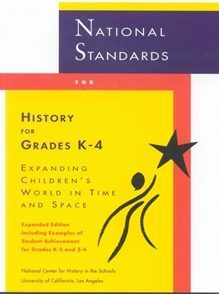 The National Standards for History for Grades K-4 provides a rich resource for elementary teachers in developing and extending their social studies programs. Building upon children’s immediate interests in the “here and now,” these standards reach out in space and back in time to explore the history of children’s families and of the men, women, and children of many ethnic, racial, religious, and cultural backgrounds who have contributed to the development of children’s own community, their state, nation, and the world. Experienced teachers of young children have developed the many lively examples of children’s active learning of these standards, specific to grades K-2 and 3-4. Rich in literature, writing and research activities, civic learnings, and investigations into historical geography, civics, economics, science, literature, and the arts. From kindergarten onward these standards present peoples and cultures throughout the world and stories, legends, and heroic tales which are part of the cultural heritage of the world.